Preparation and consumption of powdered tea was formed into a ritual by Zen Buddhists, who cultivated the green tea plant, called "sencha", by growing it under shade conditions thus maximizing the therapeutic benefits of the green tea, or what became known as "Matcha". What began as a "sencha" plant, evolved into what is known as "tencha", the basis for this highly revered and carefully cultivated shade grown green tea plant. The Zen Buddhists were very aware of the meditational benefits of this "Matcha" green tea, which brought to them a greater sense of clarity and well-being. They found that in drinking this tea before their afternoon meditations that it enabled them to be much more "centered", "focused", and maintain a level of sustained energy throughout the afternoon which they had never experienced before. This special green tea eventually became known as "Matcha, the Ceremonial tea of the temple high priests". Even the warriors, the "Shogun," saw the remarkable benefits of this "ceremonial" tea, for it gave them that extra sustained energy and mental acuity. Whenever possible, this was their "ceremonial" drink prior to going into battle. Eisai is famously quoted as saying that Matcha green tea was the "elixir of the immortals'. Matcha was extremely precious and was produced only in tiny quantities so that only the SHOGUN and nobility were able to drink Matcha. 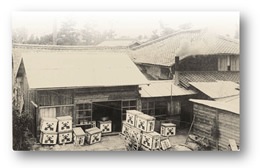 However, in 1738, Sohen Nagatani came on the scene and invented the "uji" green tea processing method. This method is still in practice and use today, and it enabled a much more efficient process to create this revered "Matcha". Matcha, the ceremonial tea of the shogun and nobility, now became more available to the public. Prior to this groundbreaking process of creating Matcha tea, only a handful of merchants had been approved to process and create Matcha. Because of this the general populace at large drank only what was called, Bancha (Houjicha), which has a brown color, and which was much more bitter to taste and lacked that beautiful resilient green color of the precious Matcha tea. Sohen Nagatani wanted the common people of Japan to be able to have access to not only brown but also this highly revered "ceremonial" or "matcha" green tea. Nagatani began to teach the farmers the secret of this "uji" processing method which had a tremendous impact on the development of the entire Uji region of Kyoto; bringing this highly revered tea to the people.